Just this past July , in Barcelona, we attended a screening of this documentary film, which depicts the resistance struggle of the indigenous peasants and fishermen of the Tehuantepec Isthmus (in Oaxaca) against an alliance of multinationals, government authorities and political parties which are determined to transform the Isthmus into “an energy park” and have resorted to the usual methods of corruption, deceit, intimidation and even murder to further their aims. Aléssi lets the people of the Isthmus speak for themselves regarding their battle against plans to build wind farms, a battle in defense of their means of livelihood, their customs and their way of life, which are seriously endangered by ongoing processes of expropriation, usurpation and privatization of ejidos1 and other forms of communal lands, that is, by the conversion of the territory into industrial capital. What is most noteworthy about their revolt is undoubtedly the autonomous popular organization that has arisen in response to the immediate needs of the struggle, the “Asamblea de los Pueblos Indígenas del Istmo de Tehuantepec en Defensa de la Tierra y del Territorio” [Assembly of the Indigenous Population of the Tehuantepec Isthmus in Defense of the Land and the Territory], which not only implies the rejection of parties, municipal authorities, and every element that represents Power, but also implies self-defense against hired assassins, paramilitaries and police. The reinforcement of communitarian practices, emerging forms of armed direct democracy, and popular justice, indicates that a positive process of secession is underway, a process that is similar to the one that has taken place in communities in other Mexican states such as Guerrero, Michoacán and Chiapas. Nor is this trend a specifically Mexican phenomenon: wherever communal ties still exist or wherever extreme conditions have compelled people to create such ties, there has been a turn towards self-management. To mention only the most well-known cases, we may refer to the 1992 revolt of the aarch Algerians, the uprisings of the population of El Alto in Bolivia (in 2003 and 2005), the insurrection of the city of Oaxaca in 2006, the ongoing resistance struggle of the Indians of TIPNIS (Territorio Indígena y Parque Nacional Isiboro-Secure), also in Bolivia, the war in Syrian Kurdistan that began in 2012, and, to a lesser degree, the neighborhood assemblies of the Greek cities. We therefore think that we are justified in claiming that secessionist communitarian protest movements, born from the defense of the territory, constitute the clearest and most advanced form of the anti-capitalist struggle. Aléssi is very well-informed about the Mexican situation and we have learned a lot from him, especially from his articles, “Las tierras comunales de Santa María Ostula” [The Communal Lands of Santa María Ostula] and “Narcos Militaros. La paranoia y el terror como paradigmas de gobierno” [Military Drug Traffickers. Paranoia and Terror as Models of Government”], which in our opinion are essential reading. Having said this, let us proceed to examine the origin of the plague unleashed against the indigenous peasants that threatens them with extermination, a plague that is none other than the capitalization of the world or the globalization of the economy, that is, so-called capitalist globalization, or what our leaders call “progress”. In Mexico, the advent of globalization can be dated to January 1, 1994, the day the North American Free Trade Agreement went into effect, which created a free trade zone embracing Canada, the United States and the Federal Republic of Mexico, that is, it abolished tariff barriers against foreign capital in trade and investment between these countries. Automatically, as a result of this agreement, the function of the Mexican State was transformed: from being the promoter of a national capitalism and the guarantor of those liberties that a bureaucratic regime based on patronage can permit, it became the necessary mediator between international capital and civil society, the guarantor of the incorporation of the national space into the world market. This incorporation, as we have seen, does not exclude the use of expeditious methods against obstinate or merely impoverished inhabitants. The general interest, which prior to the agreement was nothing but the interest of the priista2 political class, is now identified with the interest of the transnational corporations, the safeguarding of which is the job of the forces of order, which have never exhibited much in the way of scruples when it came to using violence against the common people. The obvious difficulties encountered in this changeover, the growth of drug trafficking and the proliferation of mafias within the administrative-repressive apparatus, have, on the one hand, forcefully brought an end to the reign of the statist paternalism of the past, and on the other hand, they have imposed the strategy of chaos and terror that we are witnessing today in the form of blood-curdling atrocities. This cannot go on forever: the abandonment of the land and rising levels of poverty among the uprooted masses accumulating on the outskirts of the metropolitanized cities cannot be compensated for by the job opportunities created by foreign investment, agribusiness and the petroleum industry. Nor can the political system be stabilized by the rise of a speculation-based bourgeoisie and a ridiculous middle class that is sufficiently submissive and Americanized to constitute a market for consumer goods, following the Brazilian model. Ultimately, the police-military narco-state violence that is now devastating the country is the most palpable result of twenty years of social disintegration, administrative reconversion and hard-core capitalism, that is, of untrammeled “progress” and “development”. Wherever communities have nonetheless been able to survive, defending their culture, traditions, and collective property and the regulated use of ejidos and other communal lands, this rural exodus has not taken place and social decomposition has not taken root, and as a result the penetration of these areas by mafias has been hindered and capitalist plans have encountered serious resistance. Indigenous society has raised barriers against the devastation of the territory, and has thus, without intending to do so, made itself an option and a model of a life that is superior to that of the capitalist world at a time when the new breezes of globalization are blowing towards “sustainable development”. 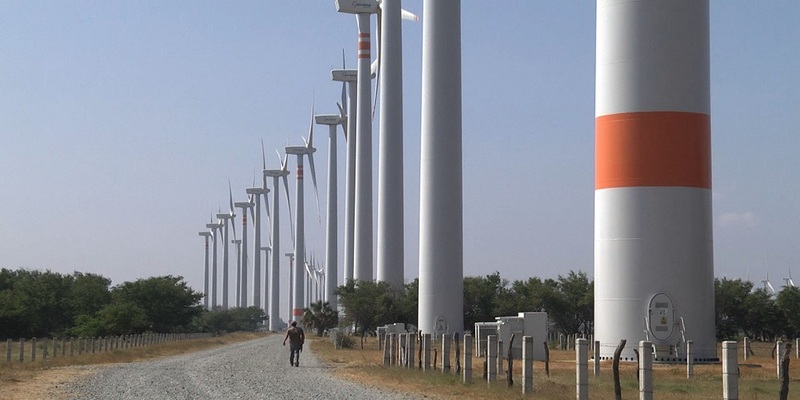 In 2006, Mexico, and particularly the state of Oaxaca, endured a new invasion of businesses eager to open strip mines, engage in exploratory surveys for resource extraction, and build prisons, highways, tourist resorts and, above all, industrial-scale wind farms, misnamed “parks”. We must call attention to the presence of Spanish corporations in this offensive, especially with respect to the wind turbine generators or “fans”, as the local people call them. Gamesa, Iberdrola, Acciona and Endesa are the most well-known, but not the only ones: Ingeteam, Preneal and Renovalia also want a piece of the action. These companies specialize in the manufacture of electronic control systems, the construction of infrastructure for renewable industries and the exploitation of “clean” energy sources. We do not need to point out that the procedures employed in the promotion of such “clean” energy sources could not have been more dirty. The capitalist assault has been waged on such a vast scale that it has provoked a response on the Isthmus consisting of an overwhelming reaffirmation of community and its values, emphasizing a conception of life that is radically opposed to the individual quest for profit and depraved consumerism, a conception based on horizontal solidarity as opposed to egoistic hierarchy. This is not the first time that this has occurred. In the first period of the capitalist penetration of Mexico, a period that was also characterized by revolutionary ferment, Ricardo Flores Magón and the Mexican Liberal Party thought that the non-individual tenancy of the land, the absence of the idea of property, the solidarity-based mechanisms of distribution, and the egalitarian and cooperative relations of the Indians, comprised the perfect alternative to the society of private property, the State and classes. It is therefore not by chance that Magonist anarchism has once again become relevant and that the example of Ricardo Flores constitutes a point of reference in the struggles for the territory: “the land comes first”. It would not be fair of us, however, to overlook the work of B. Traven, which constitutes a major vindication of Indian society. Just at the end of the revolutionary period, in 1929, a survivor of the German Revolution (Ret Marut) published The White Rose, a carefully reasoned eulogy in favor of the traditional conception of the world as opposed to the predatory mentality of the oil company executive. For the Indian, the sale of the land means the loss of his soul, breaking with his ancestors, the betrayal of his people: “the land is eternal, money is not; that is why you cannot sell land for money”. The Indians would have to be erased from the map so that economic progress could continue its triumphant march. A film based on the novel, directed by Roberto Gavaldón, with the collaboration of Traven/Marut himself, was released in 1961, and the Mexican government in power at the time saw fit to censor it. Almost a century later, the panorama has not changed as far as the land is concerned. In any case, the myth of Progress has been revealed to be a macabre illusion, placing the territorial question at the heart of the social question. For the territory is not a collection of private parcels that can be alienated for the right price, but rather an inhabited place, with its own history, its own customs, its diversity, its products and its social relations which taken as a whole define a community. And the life of a community is at the opposite end of the spectrum from life in a regime based on buying and selling. The new global offensive is an attempt to impose uniformity on the territory that still survives in order to introduce it into the market, in the process ruining the life that it hosts, by way of the imposition of models of urban survival, the separation of the land from those who cultivate it and forced emigration. In one of history’s ironies, the cities have ceased to be safe havens in order to become concrete jungles that export their misery to the rural spaces, while the latter, in those cases where industrialization has been successfully resisted, comprise the only refuge of a life with meaning, a wealth of moments that do not have a price. Translated in September 2015 from the Spanish language text provided by the editors of Revista Argelaga. Original title: “Istmeño, viento de rebeldía: un documental de resistencia al despojo, por Aléssi dell’Umbria”. Available online (in September 2015) at: https://argelaga.wordpress.com/2015/08/24/istmeno-viento-de-rebeldia-un-documental-de-resistencia-al-despojo/. 1. In Mexico, the “ejido” is a legally-recognized form of communal or village ownership of land for agricultural purposes (American translator's note). 2. Wealthy individuals, corporations, politicians and bureaucrats, and other beneficiaries of the patronage networks associated with the Institutional Revolutionary Party (PRI), Mexico’s ruling party for most of the 20th century, and currently the dominant party in Mexico’s ruling coalition government (2015) (American translator's note).